The city of Manistee is an exciting place to live and a wonderful place to visit. 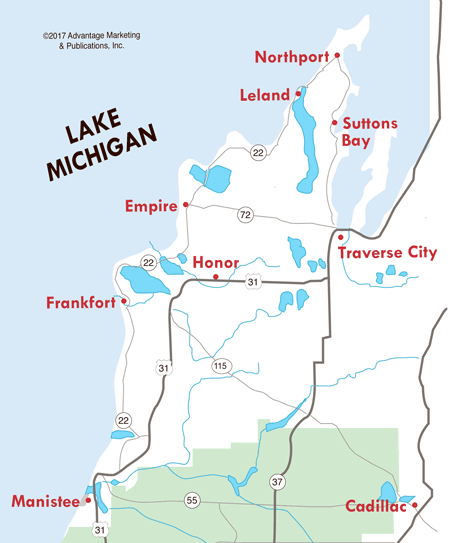 With its location along Lake Michigan, you can enjoy fantastic fishing, boating, and swimming. Within the city, you can watch a production at the Historic Ramsdell Theater, and stroll the very popular Manistee Riverwalk. 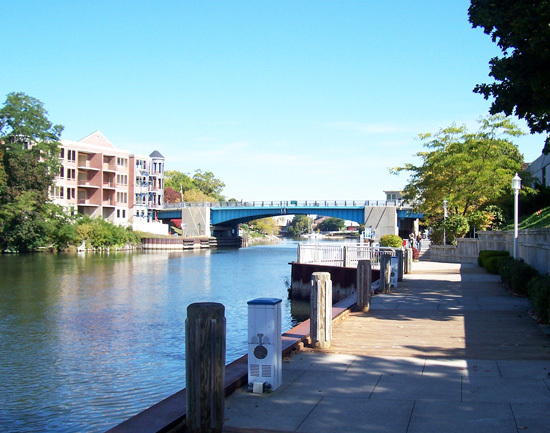 The Riverwalk follows the Manistee River...to walk the full 1.5 mile length, park at the end of Jones Street, where you'll find access to the walkway. It continues on under the US-31 bridge and meanders behind the downtown district, finally ending up at First Street beach, near the river outlet to Lake Michigan. Along the Riverwalk, there are stairs you can climb to access the many shops and restaurants in downtown Manistee. At the end of Spruce Street, you'll find a park complete with picnic tables, grills, and bench swings. It's a wonderful place to stop, rest, and enjoy a bite to eat. During your walk, you'll pass by fish cleaning stations, docks...and of course, view the large freighters and smaller vessels as they glide along the river. To provide you with information about things you may see and experience while traversing the walkway, 13 signs have been placed along downtown Manistee's Riverwalk, with mileage markers every tenth mile to track your distance. It's the goal of the Healthy Manistee County Coalition to get residents out and about, promoting a healthier lifestyle. There are also markers posted along the way that point out historical sites of importance. One of the best features of the Manistee Riverwalk is the fact it is handicap accessible, allowing everyone to enjoy it. There are ramps at both ends of the Riverwalk...at First Street Beach and next to the US-31 bridge. You can also park west of the Manistee City Marina and access the Riverwalk, or use the ramp between Division and Greenbush Streets. The Manistee Riverwalk is great for those who want to get in shape, and for anyone who wants to experience the beauty of Manistee from a unique perspective. It's unlike anything else in this area and is meant for all to enjoy.